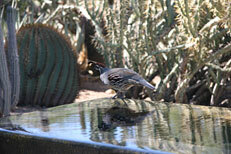 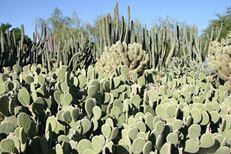 This hike was a leisurely stroll along the trails of the Desert Botanical Garden in Phoenix, Arizona. 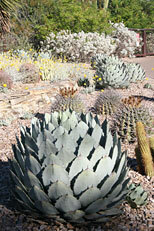 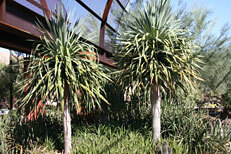 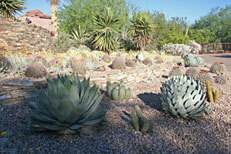 Agaves and cactus line the entry bed near the Desert Botanical Garden entrance. 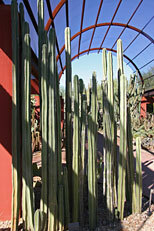 Agaves and cactus line the entry terraces near the Desert Botanical Garden entrance. 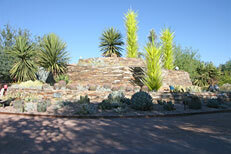 Dale Chihuly glass sculptures in the Garden's entrance bed. 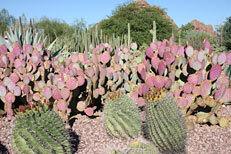 Barrel Cactus (Ferocactus wislizeni) in front of Purple Pricklypear (Opuntia santa-rita). 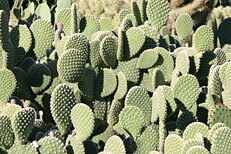 The pads of the Bunny Ears Pricklypear, (Opuntia microdasys), sport dense clusters of glochids, very fine hair-like spines that are easily detached and embedded into skin. 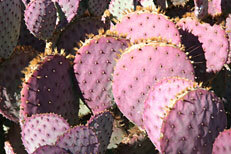 Purple Pricklypear (Opuntia santa-rita), will turn shades of purple under stresses such as drought or cold. 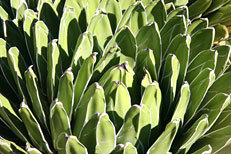 Queen Victoria Agave (Agave victoriae-reginae). 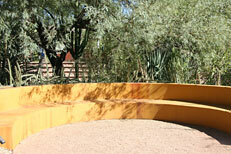 Have a seat on the orange bench. 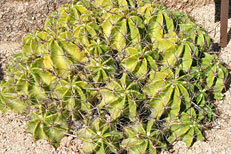 Mexican Fence Post Cactus (Stenocereus marginatus). 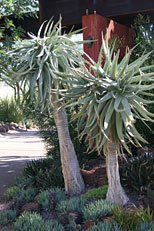 Aloe 'Hercules' is a tree aloe hybrid between Aloe dichotoma and Aloe barberae. 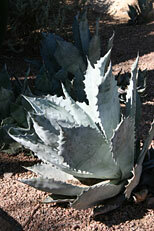 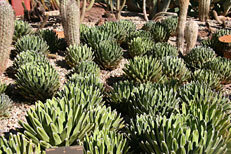 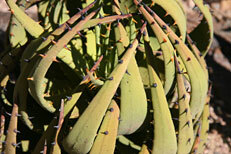 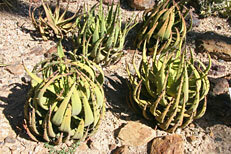 The leaves of Black Thron Aloe, (Aloe melanacantha), curve inward in time of drought and heat. 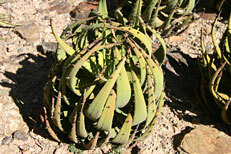 Black Thron Aloe, (Aloe melanacantha). 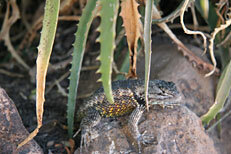 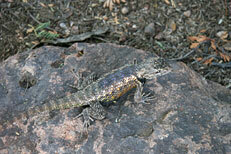 Desert Spiny Lizard (Sceloporus magister). 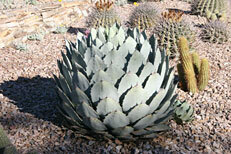 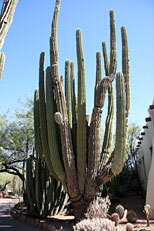 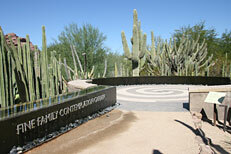 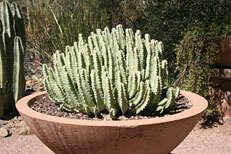 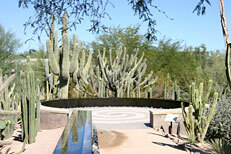 One of the largest cactus species,the Cardon Cactus, (Pachycereus pringlei), can reach heights of 60 feet. 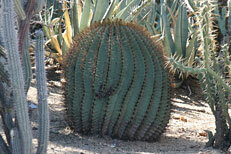 Clump Barrel Cactus (Ferocactus robustus).